Dog gets stuck down badger hole Jump to media player Fire crews used a bendy rod with a camera on it to find the dog who was 3m (9ft) deep. Dog rescued at sea Jump to media player A coastguard team rescued a stranded dog off the coast of Scotland on Sunday. Dog rescued after cliff fall Jump to media player A dog has been rescued by the Royal National Lifeboat Institution (RNLI) after falling 80ft (25m) from a cliff in Devon. Helicopter rescue for trapped dog Jump to media player Firefighters in Los Angeles have carried out a dramatic rescue of a dog trapped in a river. 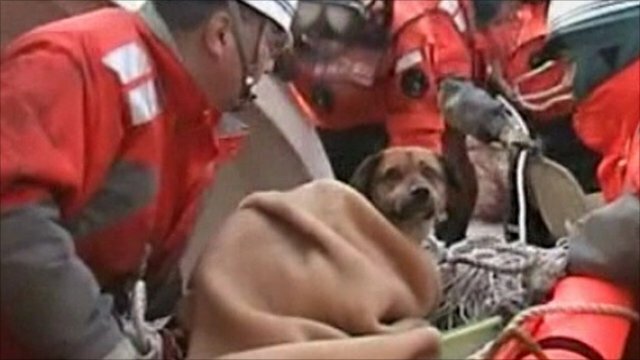 Tsunami dog rescued at sea Jump to media player Coastguards in Japan have rescued a dog from the top of a house washed out to sea by the earthquake and subsequent tsunami that hit the north-east coast of the country three weeks ago. A Jack Russell had to be rescued from a disused badger sett in Ley Hill, Chesham, after getting stuck. RSPCA officers called in badger experts to assess whether or not the sett was empty. Fire crews used a bendy rod with a camera on it to find the dog who was 3m (9ft) deep. He was able to find his own way out using the light on rod and was returned to his owner uninjured.